B&H assembled this Kowa TSN-884 25-60x88 PROMINAR PFC Spotting Scope Kit to give you a complete spotting scope rig for all your glassing needs. Normally sold separately, the kit consists of the PROMINAR PFC spotting scope body and their wide-angle eyepiece that produces a generous zoom range. All you need to get started is a reliable tripod or other support system. The Kowa straight-viewing TSN-884 88mm PROMINAR PFC Spotting Scope is a world-class caliber optic that redefines standards of color brilliance, sharpness, and brightness consistency. Kowa reinvented themselves again with the TSN-884, fastidiously examining each technological and ergonomic detail to produce the very best all-weather straight-viewing prismatic spotting scope. The TSN-884 uses an element of pure fluorite crystal (PFC) glass in its construction, which greatly minimizes chromatic aberration. This ensures maximum efficiency in its light gathering, producing a clear visual range and sharp imagery that traditional glass lenses cannot attain at their highest magnifications and with the strongest of subject/background contrast changes. Fluorite is extremely expensive, but the subtle difference between the viewing from the PROMINAR-equipped TSN-884 and even the very best normal scopes would be apparent even to a novice. Kowa's use of their patented C3 prism multi-coating process increases image brightness significantly over their prior-generation models that featured flourite. The 884's housing is made of a magnesium alloy that defines maximum durability and lightweight construction, resulting in a compact, ergonomic, and functional design for extreme nature and outdoor enthusiasts wanting only the very best. It sets a benchmark for the combination of large objective with small weight and mass. As the straight-viewing model of Kowa's flagship line, this scope makes for an easy time in sighting your subjects and is best suited to solo observers or for whenever observing from an elevated position. 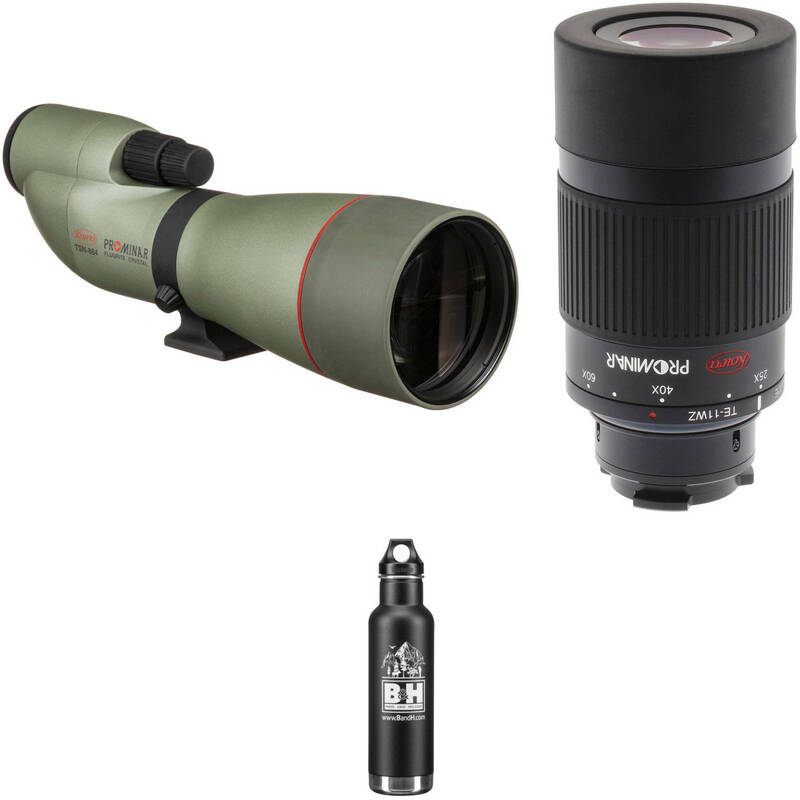 With premium optical elements, a broad magnification range and a wide field of view, the Kowa'sTE-11WZ 25-60x Wide Zoom Eyepiece offers a bright, sharp, and expansive viewing experience with Kowa TSN770 and TSN880 spotting scopes. The TE-11WZ features two XD extra-low dispersion lenses for a sharp image with minimal aberration, and a generous 2.4-1.3° field of view. The 17mm eye relief makes for comfortable use even while wearing glasses, and it also makes the TE-11WZ a good choice for digiscoping using Kowa's separately sold dedicated camera adapters. The TE-11WZ can also be the eyepiece when using Kowa's TP556 Telephoto Lens as a spotting scope. With the TP556, its magnification range is 28-66x, and its field of view is 2.2-1.2°. Keep 20 fluid ounces of your beverage hot or cold when you bring along the Klean Kanteen Vacuum Insulated Classic Water Bottle with loop cap, in a shale black with the B&H logo. Double-wall, stainless steel construction ensures the contents stay hot for up to 20 hours or iced for up to 50 hours. The electropolished interior prevents flavors from lingering and aids in cleanup. The wide-mouth 1.75" opening makes it easy to add ice. Box Dimensions (LxWxH) 16.7 x 6.75 x 6.7"
Box Dimensions (LxWxH) 6.25 x 3.05 x 2.95"
Box Dimensions (LxWxH) 11.45 x 4.75 x 4.35"